This past weekend I took the plunge and began the cleaning process to turn a guest room in to a new office area for myself. I need the space and I hate it when a room just doesn’t seem to have a purpose, like this one lacked. My favorite part is the decorating and the moment I get to sit down, once it is all done, and take everything in. I love that feeling of accomplishment. The part that is the least enjoyable for me is the starting and the cleaning. Cleaning out a room that we once used to store everything that had no home is daunting. It means that we now need to tackle the question “Where on earth should we put this?” And with a room that houses the junk no other room wants comes the staleness. Everything has been sitting for awhile. The room isn’t inviting, the air doesn’t smell fresh, everything seems dull. This was AFTER I cleaned it. Now to start planning. Being a Lysol #HealthyFamilies Ambassador means that I have the opportunity to try out some of their products. My favorite so far has been the Fabric Refresher. This doesn’t just mask the odour, it kills the bacteria that causes any odours thus completely removing it. I have to admit, I was a spraying fool. After I got a whiff of the wonderful Blossoms & Springtime scent, I went crazy. I sprayed the curtains, the mattress and box spring that was in the room, an old fabric knitting holder (okay, two of them) and the floor. I did the floor lightly then took a break for lunch. When I came back to vacuum, it was dry and after all of that spraying, the room felt inviting. All of the items that I sprayed had one thing in common. I couldn’t just toss them in the washer and easily clean them. The Lysol Fabric Refresher worked great on all of the items. I am far from done and will be posting more of my office transformation in other posts, but lat weekend’s cleaning was a great start. I can’t stop walking in to my new office area. I finally have a place to officially write. 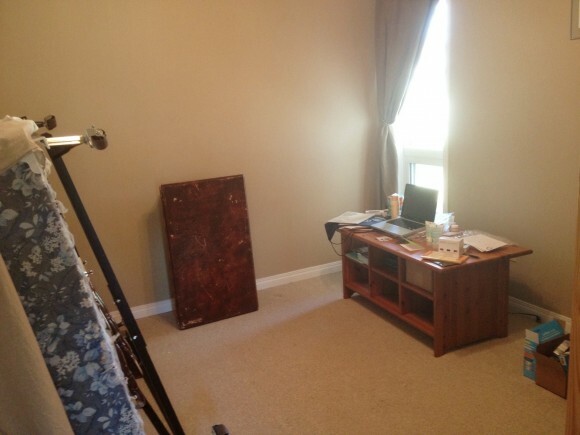 This post is the first post written from my soon-to-be office. I’m so excited. Want to learn more about the Lysol Fabric Refresher? Make sure you check out the Lysol Canada Facebook page and LIKE them for updates, tips and product information. This is exciting because they just launched their Facebook page a couple of weeks ago. I know, I can’t wait. I need to organize myself. I’ll be spraying that Refresher a lot in my new office.